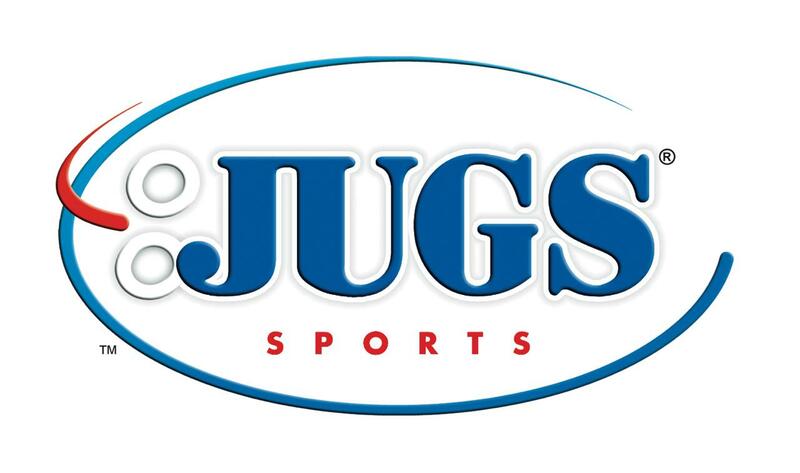 Sold by: JUGS Sports, Inc.
Amazon's Choice for "baseball tee"
Will not tip over. No outside weight needed. 24" - 46" Stem. 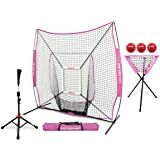 Sold by Baseball Training Nets and ships from Amazon Fulfillment. The perfect tee for any age or skill level. 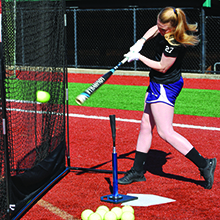 Hitters can work on their swing mechanics throughout the strike zone. 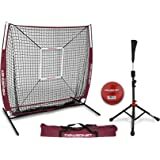 Great for high- and low-tee drills. Longest guarantee and lowest price for a pro-style tee. 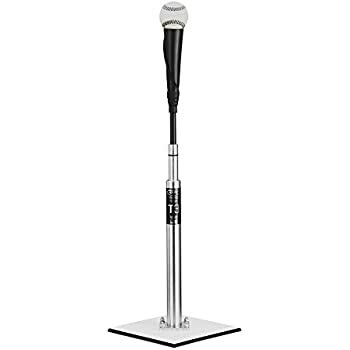 Large 14" x 11", 1/4"-thick steel base adds stability. Rubber covered base with rounded edges won’t scuff gym floor. Unlike similar designed tees, our internal interlocking bolt design prevents slippage of the upper tee stem. Telescoping stem unscrews from base. Always-feel-the-ball™ flexible top. Feel the ball on contact, not the tee. Will not tip over. No extra weight needed. 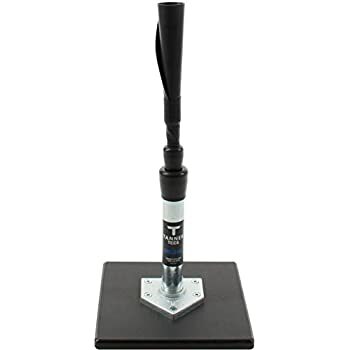 Always-feel-the-ball flexible top—Feel the ball on contact, not the tee. 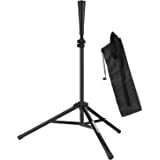 Rubber encased weighted base means—No extra weight needed. Makes for easy transport and will fit into most travel bags. 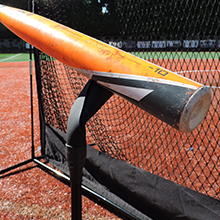 With an adjustment range up to 46 inches and a sturdy weighted base, the JUGS T is ideal for slow-pitch softball practice. Introducing the latest edition to our hitting tee collection, the NEW JUGS T. No one offers a longer guarantee or lower price on a tee of this quality. Will not tip over. No outside weight needed. 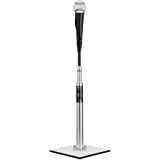 Large 14'' x 11'', 1/4"-thick steel base adds stability. Tee weight: 10 lbs. 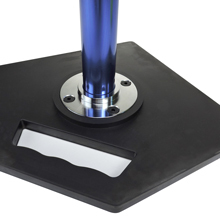 Rubber covered base with rounded edges won't scuff gym floor. 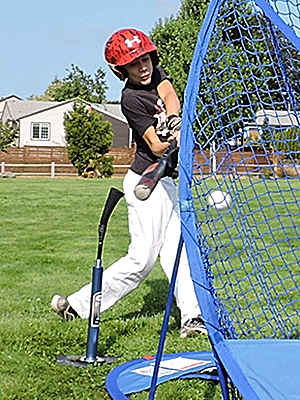 Quick adjustment range of 24” to 46" allows hitters to work on their swing mechanics throughout the strike zone. Always-feel-the-ball flexible top. Feel the ball on contact, not the tee.Unlike similar designed tees, our patented internal interlocking bolt design prevents slippage of the upper tee stem. 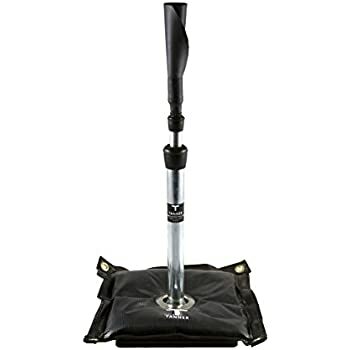 Telescoping stem unscrews from base.Base with patented grip-n-go handle makes for easy transport and will fit into most travel bags. 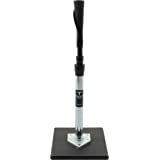 Great for high and low tee drills. 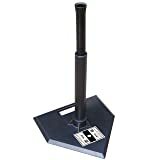 This review is for the New JUGS T.
I coach a 14U fastpitch team that my daughter plays on, and my son plays high school baseball. I've used just about every kind of tee out there and the problem with most of them is that they either break after a year or so of use, or they tip over too easy. I think that buck stops right here. This tee is awesome! My son and daughter use this tee almost every day plus I use it for my travel softball team. It takes a pounding and has held up like a champ. 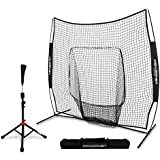 I would have to guess that about 6,000 swings or more have been hit off of it so far and it has only tipped once (due to a player hitting the middle of the shaft - bat slipped). I love that this tee goes from as low as 23" up to a height of 46" so you can adjust for just about any scenario. The base is weighted (about 8 lbs) and the overall weight is about 10 lbs for a great stability. The base also has an easy carry handle built right in. As for overall quality, I would compare this to the original Tanner Tee except you don't need a weighted bag to keep this one upright. I highly recommend this tee to any coach at any level. Period! It has a 1 year gaurantee! Best thing about the Jugs tee---it will NOT wobble, move foward, or fall down! 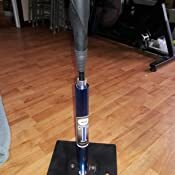 My son can take the tee apart and put the pole portion in his batting bag on the side where a bat can go & the weighted part inside his batting bag. He carries it to the baseball field for practice too. (it is EASY & QUICK because he is not a kid that's going to waste time on something that takes a long time to fiddle with). 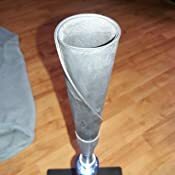 The metal base is very stable on Bermuda grass/ not thick ...out in the country yard kind of Bermuda grass (our yard is not level in some areas & he can hit the ball as far as he wants on our land so he is definitely hitting this Jugs stand hard). He hits real hard--he's the boy that bats the ball all the way to the fence in the games. 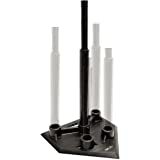 **UPDATE: he has used it at the baseball field that has little orange rock things for their infield area & the Jugs tee will NOT fall over or wobble/move forward there either. :) It is used daily and shows no sign of wear, and we have had it for over a year now. It still looks brand new, minus some dust on it. :) A boy on our baseball team bought one too & his family likes it. 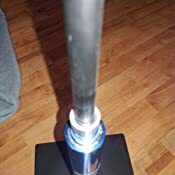 Update December 2018--- This tstand is worth every penny! Our friend that bought one too after seeing and using ours.....theirs is still doing great too! My husband hits off of it as well & he's 6 ft. tall, 200 lbs. and the Jugs handles his hard hits too. 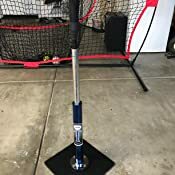 Both dad & son can hit it over our fence & we have land so when I say they're hitting it over the fence...they are really ripping it off the tstand so it's holding up quiet well and it looks as good as the day I bought it...and it is over a year old and used ALOT and it looks great. 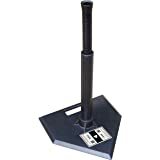 My son is played with the high school team this summer & varsity in the fall and he still hits off the Jugs t-stand so they do not outgrow it. Totally worth it! 5.0 out of 5 starsYou get what you pay for!!! 5 star! Very well made. Adjusts with a type of air piston. Does not adjust lower enough for smaller kids like 5-9. My son was working on low and inside and it just wouldn't lower enough and he's 12. 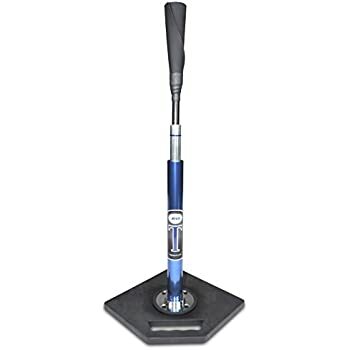 The top where you sit the ball on is a thick rubber. I'm sure if down the road it wares out you can buy a new one.. My only concern since it's made so well it that in 10-15 years of I pass it on is that the "O" rings might ware out. But a friend of mine bought a less expensive model which still cost $59. Broke the first day. The t is comparatively smaller than all other tees I've seen. It is pretty heavy so it won't tip easy . It has a handle and unscrews into 2 pieces which makes it mobile. 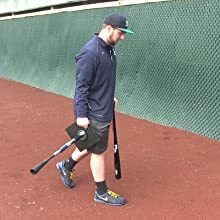 You can easily carry in most baseball bags. It is made in tiawan but unlike most things made in tiawan Jugs seems to have made a commitment to quality. Every piece and part of the tee seems very durable and built to last. I , like most, bought a $30 black rubber tee you see in the box stores and online and like most regret it. The thing cracked after a few hits. I duck taped it over and over . It is functional and I still use it but I wish I would have ponied up years ago and bought this tee instead. Simply put, it is worth the money. This is seriously high quality. 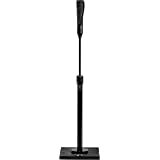 This tee can't be compared to any basic all rubber base and tee pole that you have seen or used before. This product is outstanding. 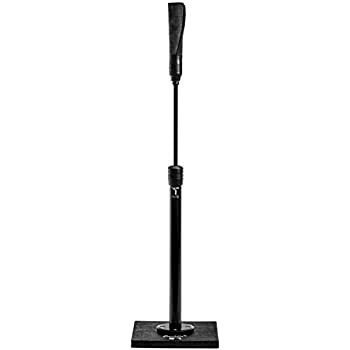 There are multiple ways to raise and lower the height and the hand grip carved out of the base of this tee is a life-saver. I can't speak high enough about this tee. The only downside (if any) is that the bottom half is a high gloss metal. 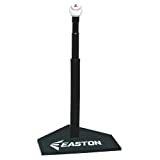 If you were to strike it hard with a bat I think it has the potential to dent and thus make the shafts inside not raise or move at all. 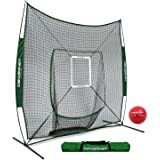 Not certain of that, plus my 11 year old has been playing for 6-7 years now and would never swing that far off, but it may be a concern for younger tee-ballers. 5.0 out of 5 starsLove this tee! I got so tired of my $25 made in China tees that you get at Big 5 not even lasting a season. Decided to bite the bullet and spend on something of quality. This Jugs tee is everything I want! I loved it so much the moment I got it, I bought a combo pack a couple days later. What's exceptional about this tee is that it can go up to 46" in height. I've got girls struggling with high strikes. This tee is allowing them quality reps to work on their swing. 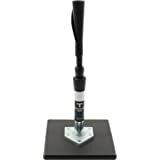 The shape of the base also allows precise positioning at home plate for inside and outside pitch work. This tee is bomb!